It's official. This summer's heat scored a clean sweep. The final numbers on this scorching season have arrived, and they are not disappointing. 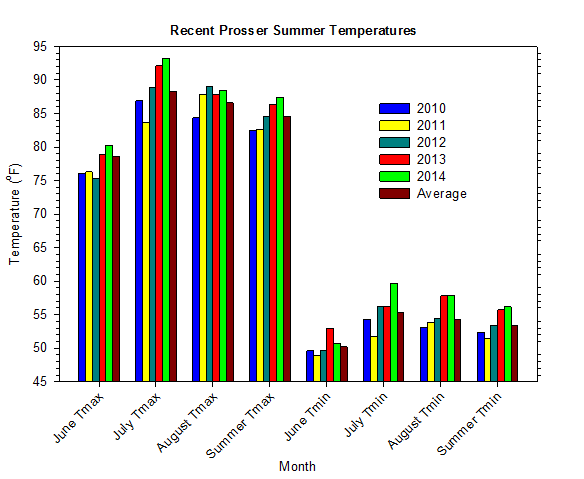 2014 was Prosser's hottest summer on record, and not only in terms of the overall mean, but also the mean high and mean low. In fact, nearly 12 years have passed (winter 2002/2003) since Prosser experienced such large (positive) anomalies of high, low, and mean temperature in any season. One must travel farther back in time to the winter of 1998/1999 to find a season when the mean high temperature was so far above normal. Placed in an even broader context, this summer follows the warmest spring in twenty years, which makes the 2014 growing season an unusually prolonged period of anomalous warmth. Still, the hot summer should not be a surprise. 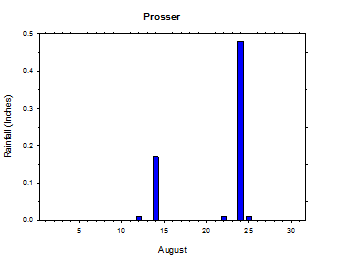 The season ended with the hottest August on record in terms of the overall mean and mean low temperature, while July 2014 was Prosser's hottest month ever. August began with sizzling temperatures, and the Tri-Cities had already recorded 5 - 100°F+ days by the 11th, at which time their high temperature peaked at 104 degrees. Despite some slight heat relief around mid month, it was not until the end of August that more pleasant conditions finally arrived in Washington. The high temperature at Pullman was only 69 degrees on the final day of August. Although much of the month was dry, there were several stormy periods of convective activity during which isolated, heavy rainfall amounts were observed. One such period occurred from August 13th to 15th. On the 13th, Snohomish recorded one inch of rainfall, while Fourmile measured 0.93 inches in association with passing thunderstorms. On August 14th, Boyd District received 1.5 inches of rain, which was followed by over one inch at Almira on the 15th. 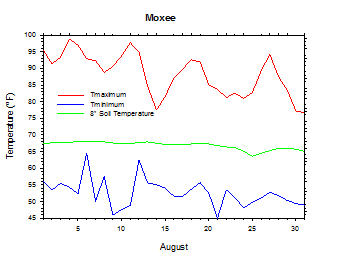 Another active period later in August brought 0.66 inches of rain to College Place on the 22nd, and then 0.89 inches to Moxee on the 24th. Finally, Montesano recorded 0.8 inches of rain on August 30th. July was consistently hot, and featured two notable heat waves. The first occurred around mid month, and was highlighted by a sultry low temperature of 84 degrees at Wahluke Slope on the 13th, and then a high temperature at the Tri-Cities of 109 degrees on the 16th. At month's end, another hot spell sent temperatures soaring into the 100s across most areas east of the Cascades. Unfortunately, the Carlton Complex fire was one result of the scorching weather, and burned more than 400 square miles to become the largest wildfire in state history. The only interruption to the hot and smoky weather was a potent upper low that spawned wet weather, including 1.51 inches of rain at Lawrence, on the 23rd. 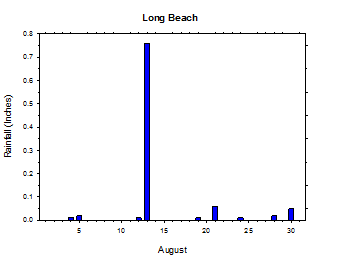 In contrast to July and August, June was a relatively uneventful month. Conditions were generally warm and dry, except for a cool and wet period around mid month. High temperatures on August 1st were generally in the 90s to low 100s east of the Cascades, and mid 70s to 80s in the west, except the upper 60s at Long Beach. Lows were in the upper 40s to around 80 degrees. Some thunderstorms were observed on August 2nd, along with convective debris clouds during the afternoon. Highs on the 4th soared into the 90s to mid 100s in eastern areas, and 80s to low 90s in the interior west, but only the 60s at the coast. Lows were in the 50s to around 80 degrees. Highs on the 8th were slightly cooler in the 80s to low 90s in the east, and 70s in the west. Lows were in the mid 50s to 60s. Highs on August 9th reached the upper 60s to mid 90s, with lows in the 40s to 60s. High temperatures on August 11th were in the 90s to low 100s in most areas, except for a few, isolated 70s and 80s in parts of the west. Highs on August 12th soared into the upper 80s to around 100 degrees in the east, but only 70s to low 80s in the west, while remaining even cooler at the coast. As a thunderstorm passed over Garfield East during the evening, winds gusted to over 70 mph. Heavy rain squalls fell elsewhere, as convective activity raced across eastern Washington. Highs on the 13th varied from the 60s and 70s in the west to the upper 70s to 80s in the east. Lows dropped into the 50s and 60s. Significant rain fell across much of western Washington, including one inch at Snohomish, and nearly as much at Sequim. Although much of eastern Washington remained dry, a few isolated heavy rain totals were observed in association with thunderstorms, including 0.93 inches at Fourmile. The high temperatures on August 14th were in the 70s to mid 80s in the east, and 60s to mid 70s in the west. Lows bottomed out in the mid 50s to mid 60s. Heavy rain fell in parts of eastern Washington, including 1.5 inches at Boyd District. Highs on the 15th were in the upper 60s to 70s in western Washington, and 70s and 80s east of the Cascades. Additional rain fell in eastern areas, including 1.07 inches at Almira. High temperatures on August 17th rose into the mid 80s to mid 90s in the east, and 70s to mid 80s in the west. Lows fell into the 50s and 60s. Highs on the 21st climbed into the upper 60s to 70s in the west, and upper 70s to 80s in the east. Lows dropped into the mid 40s to mid 60s. One-quarter inch or more of rain fell across much of north central Washington, including 0.41 inches at Brewster. Highs on the 22nd were in the 80s in central areas, and 70s elsewhere, with 60s near the coast. Lows were in the mid 40s to mid 60s. Some rain fell in the east, with 0.66 inches measured at College Place. High temperatures on the 24th reached the 70s in western areas, and mainly upper 70s to mid 80s in eastern areas. Lows were in the upper 40s to mid 60s. Isolated heavy rain totals fell in central and eastern areas, with 0.89 inches recorded at Moxee. Highs on the 25th reached mainly into the upper 70s to 80s. Lows were in the upper 40s to mid 60s. Highs on the 27th were in the 80s in the interior west, with upper 80s around the eastern border, and 90s in central areas. Lows fell into the upper 40s to low 70s. Highs on the 31st reached the upper 60s to 70s statewide, with lows in the upper 40s to around 60 degrees. Light rain fell around Seattle, and breezy conditions continued in eastern areas. The average August temperature at Prosser (WSU IAREC) was 73.0°F, which is 2.6 degrees (1.5 standard deviations) above average. The average high temperature was 88.5°F, which is 1.9 degrees (1 standard deviation) above average. The average low temperature was 57.9°F, which is 3.6 degrees (1.7 standard deviations) above average. The maximum temperature recorded last month was 99.5°F on August 4th, while the coolest daily high was 75.7°F on August 31st. 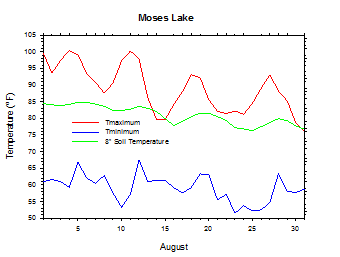 Low temperatures ranged from 66.6°F on August 12th to 49.6°F on August 31st. Daily average temperatures ranged from 81.2°F on the 1st to 62.2°F on the 31st. The monthly precipitation total was 0.68 inches. 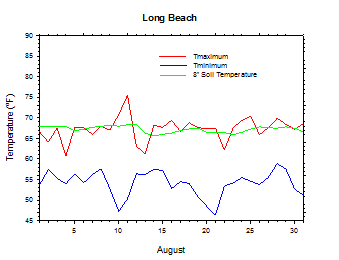 The average wind speed was 3.8 mph, and the average 8 inch soil temperature was 74.9°F. 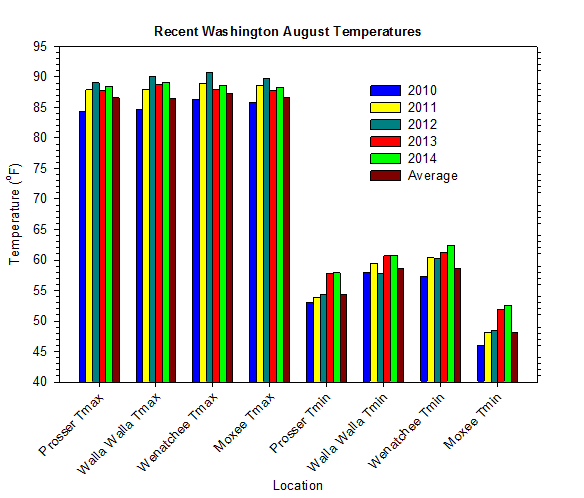 Wenatchee (WSU TFREC) recorded an average temperature of 75.3°F, which is 2.2 degrees above average, while Walla Walla's average monthly temperature of 74.8°F was 2.1 degrees above average. 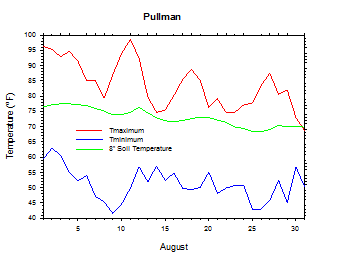 Pullman was one of the cooler spots in eastern Washington, with an average August temperature of 68.3°F. In western Washington, Mt. 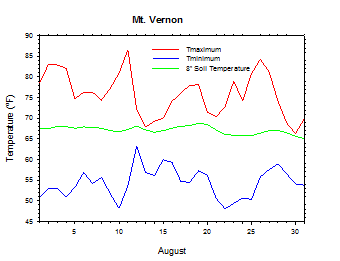 Vernon's average temperature was 64.4°F, which is 2.0 degrees above average. August 4th: The high temperature at Wenatchee rose to 101 degrees. August 11th: The high temperature at 21 Acres, near Seattle, soared to 100 degrees. August 12th: The wind gusted to over 70 mph at Garfield East during a thunderstorm. August 15th: 1.07 inches of rain fell at Almira. August 31st: The high temperature at Pullman only reached 69 degrees. 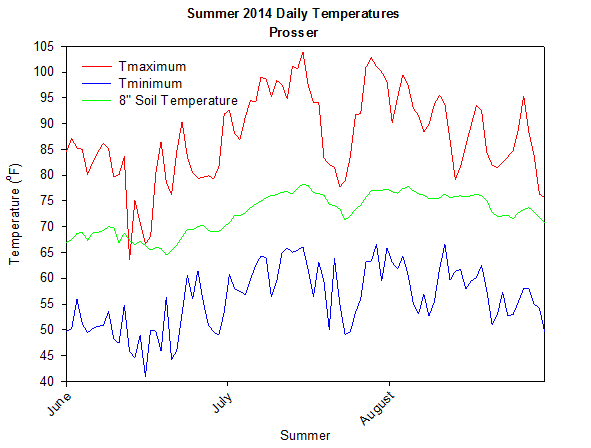 June was a warm, somewhat dry, and generally unremarkable month. A wet upper low brought rain and cool temperatures to the state on June 17th. 0.87 inches fell at Fairfield, while Garfield East recorded a high temperature of only 46 degrees. Other highlights of the month include a 90-degree high temperature at the Tri-Cities on the 2nd, and 1.15 inches of rainfall at Brays Landing on the 13th. 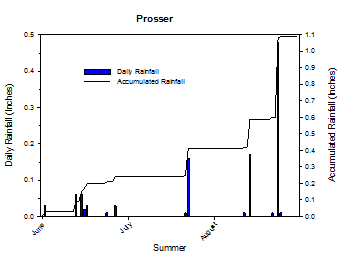 July was a memorable period which ended up as the hottest month on record at Prosser. A major heat wave occurred around mid-month, as the temperature peaked at 109 degrees at the Tri-Cities on July 16th. In total, the Tri-Cities observed 10 July days on which the temperature eclipsed the century mark. 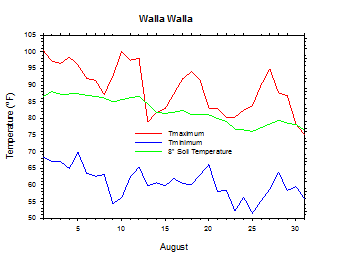 On July 13th, Wahluke Slope experienced a low temperature of 84 degrees, which was one of 18 July nights when their low failed to drop below 70 degrees. Temperatures again soared into the 100s during another heat wave at month's end. The only deviation from the relentless heat occurred on July 23rd. A strong upper low brought 1.51 inches of rain to Lawrence, near Bellingham, along with a 50 mph wind gust to FishHook. One unfortunate consequence of the prolonged heat was the 405 square mile Carlton Complex wildfire, which became the largest in our state's history in late July. The average summer temperature at Prosser (WSU IAREC) was 72.3°F, which is 2.8 degrees (1.9 standard deviations) above average. The average high temperature was 87.4°F, which is 2.8 degrees (1.4 standard deviations) above average, while the average low temperature was 56.2°F, which is 2.9 degrees (1.8 standard deviations) above average. Daily high temperatures ranged from 103.9°F on July 16th to 63.6°F on June 13th. 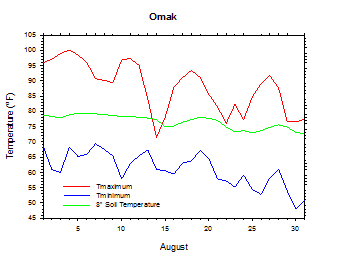 Low temperatures varied from 66.6°F on August 12th to 41.0°F on June 16th. Daily average temperatures ranged from 84.9°F on July 16th to 55.4°F on June 16th. 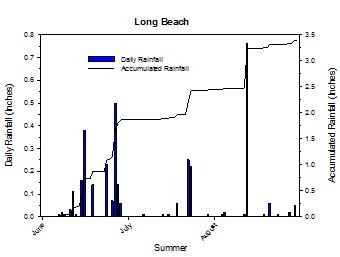 1.09 inches of rain fell during the summer season. 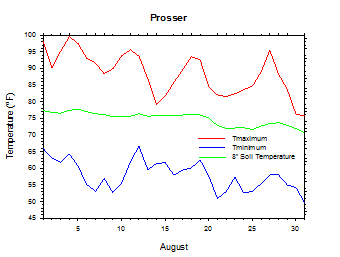 The average wind speed was 4.2 mph, while the average 8 inch soil temperature was 72.6°F. Other locations also experienced above normal summer temperatures. 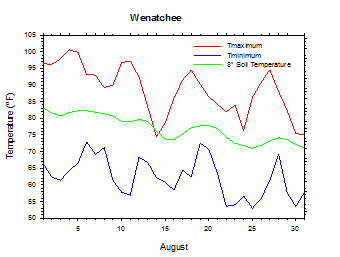 Wenatchee (WSU TFREC) had an average seasonal temperature of 74.7°F, which is 2.9 degrees above average. June 2nd: The temperature at the Tri-Cities rose to 90 degrees. July 16th: The temperature at the Tri-Cities climbed to 109 degrees. July: Record heat and somewhat dry. As of August 25th, winter wheat harvest was ending in northern Lincoln County, while southern areas of the County were beginning to seed. Despite a promising cherry harvest, some peach blocks lost 60% of the crop due to split damage. Peach harvest was 60% complete in the Maryhill area, with many more splits than in recent years due to extreme heat and associated rapid growth. In vineyards, grape varieties were between 80% and 100% of veraison. As of August 18th, corn, berry, and tomato harvest continued, and gala apples were coming in with good quality and size. Overall, keeping up with irrigation demands was difficult for many growers during the hot summer weather. As of the end of August, late-season peach and nectarine varieties were coming in, while wine grape growers anticipated that harvest would begin two weeks ahead of schedule. Hop harvest had just begun, while pea and potato harvest persisted in Grant County (National Agricultural Statistics Service). On August 4, 2012, the temperature at Vancouver soared to 101 degrees. According to the Climate Prediction Center (CPC), warmer than normal conditions are likely in September, and well into 2015, while drier than normal weather is somewhat likely for much of the coming autumn and winter. El Niño continues to develop, and is now expected to peak at weak to moderate strength in the late autumn/early winter.